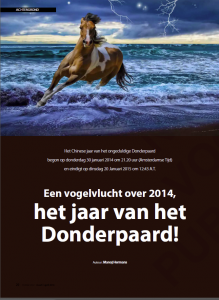 We are glad to present to you the 32nd AKHALDAN I CHING CALENDAR, showing the Chinese Year of the Thunder-Horse 2014. 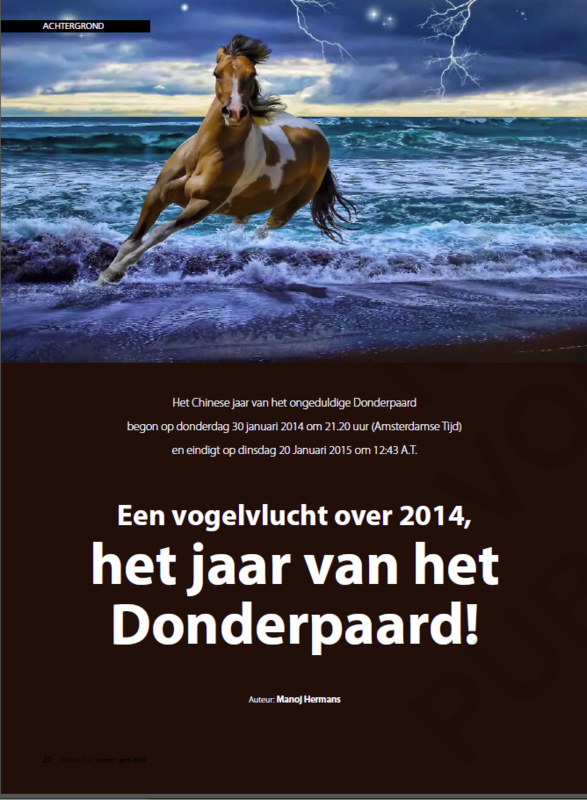 This year starts on Thursday the 30th of January 2014 at 21,20 A.T .(Amsterdam Time) and ends on Tuesday the 20th of January 2015. A short Chinese astrological year! Attention: The Moon in the upper right corner of the little squares (vector) is not shown every day, only when enters in a new star sign. You can see when is enlightened . When the same I Ching Hexagram happens the next day, with the same line functioning and the Moon in the same star sign, it is not repeated and shown. Gives me more space to write down the oracle’s judgement (which specific line comes into existence) of that specific day! The Chinese star sign Horse is the Chinese equivalence of the western star sign Sagitarrius I meaning: Long travelling, life opinion, ideals, religion, wisdom, tolerance, open-mindedness, philosophy, expansion, university, other cultures. This year will express a lot of Samsara (0 till ‘‘days). The Time Spirit is low from February 2014 till the 19th of July 2014 and in October and beginning of December 2014! Very high in August, September 2014 and January 2015, with even 7 stars days enlightened! So important: Be receptive and in they heart, withdraw into the inner Self. It is a time where the good has to hide and the bad one’s dictate, as it seems! But not for long (see January 2015) A Horse is bright-minded, wants insight, wisdom, to graze the horizons, travel long, see other cultures and therefore very impatient. This year is Yang, outgoing, philosophical. It is governed by the planet Jupiter V = Expansion, growth. The colour is purple and the tune is la ( A ). So this will be a year of gaining wisdom, meeting other cultures and at the end enlightening! . for now is the time of reverence. As God comes forth in THE AROUSING. to set his life in order and to shape it. All things arise from Tao. They are nourished by Virtue. They are formed from matter. They are shaped by environment. developed, cared for, sheltered, comforted, grown and protected. Secret Dakini Oracle 51 = : The Path of the Self related to Psyche evolution, abandoning of restrictions made by the ego, adaptation, unconscious motivations. AKHALDAN is an astro-ecological society of learned beings like you and me, since 1983. You can get a PDF copy of this calendar by contacting the above email or website! 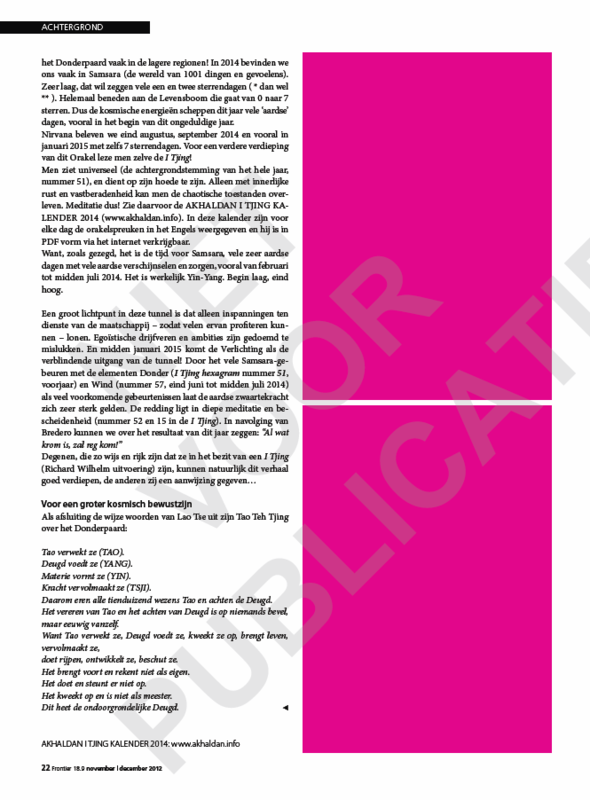 Stichting Akhaldan wenst jullie een vrijheidslustig, bezinnend, grensverleggend en gezond nieuwjaar toe van de lichtgroene Donderhaas. 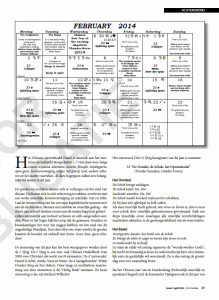 A PDF-copy of this calendar is available for just little support of AKHALDAN (contact also m.m.a.hermans@gmail.com). 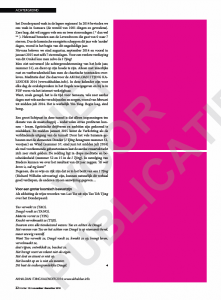 We like to get some feed-back about the I Chingcalendar and other products of AKHALDAN. Positive influence of the Occult, influence of Forces, Transport and Delight, change of residence, development, ecstacy of transport out of the physical body, crystalization of the powers of visualisation, a strong desire not to be bound up by the physical world. 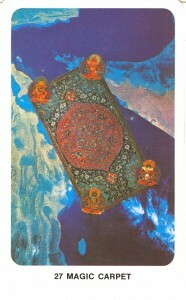 Meditate on this card as a form of the Liberated Spirit, the Astral Body, higher aspirations along a ecstatic lines and the potency of a moment of harmony and balance, Flying Carpet a vehicle linking the worlds of Reality and Surreality! 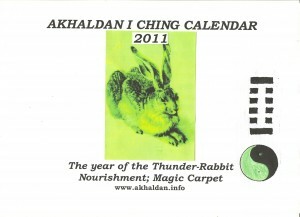 We are glad to present to you the 28th AKHALDAN I CHING CALENDAR showing the Chinese Year of the Thunder-Tiger 2010. This year starts on Sunday the 14th of February 2010 at 2:32 A.T. (Amsterdam Time) and ends on Thursday the 3rd of February 2011 at 2;13 A.T. As you can see there is another lay out! 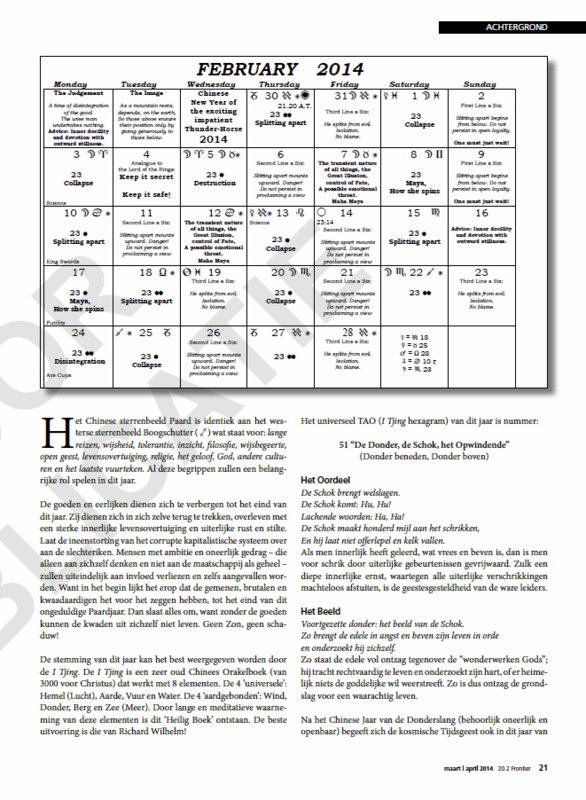 No more cards of the Tarot mentioned in the left corner down, This calendar is now only an I Ching Calendar. The Moon in the upper right corner of the little squares is not shown every day, only when enters in a new star sign and you can see when is enlightened ( ).